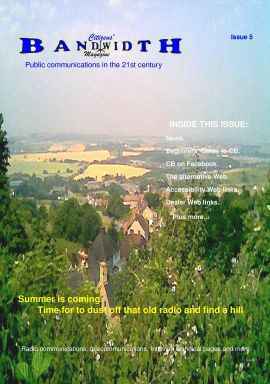 Issue 5 of Citizens Bandwidth is now available for download. The magazine requires a large amount of work, taking more hours that there are in the day. This has led to delays as each issue takes longer that a month to produce. This is mainly down to the large amount of work involved and the small number of people involved in getting it done. Unfortunately, this means that the magazine cannot presently be produced monthly, as was planned. It is not possible to get everything done in that time, so the magazine will now become quarterly. This is not what was wanted, but there is no other way to continue at this time. This is not about profit, the magazine and sites make absolutely no profit. Unlike some other free sites, we do not ask for or accept "donations". We would, however, welcome any offers of help from other enthusiasts. This could be news, reviews, technical articles, graphical content - anything that could speed up the process of creating each issue. All our sites are free to use, with no catches. We do not expect people to buy anything from us, we have nothing to sell you. What we do is offer free, unbiased information to the public. We also have special functions on this site such as our microphone wiring database and combined dealer, club and site search engine on every page. All created for, and hosted on this site. All content you see on this site is hosted on site, there are no third-party scripts and no third-party content providers pushing cookies or secret downloads on you from this site. If it appears on one of our pages, then it is on our site. All pages are hand coded for compatibility with different browsers, which is why we do not need to tell you what browser to use or how high to set your security. You may use the all-in-one search box on any page to search for pages on this site, dealers, clubs and related pages on other Web sites in our database. Just type in keywords and click the button to have all these searches done in one go. For dealer or club searches you may enter an area code, town, city, etc. For a list of on-line dealers, search for the word "web". By now, smart people are probably wondering about funding. If not, then you should be. After all, there is no such thing as a free lunch - someone must pay. This site and the magazine were started as a spare time project, totally at the cost of the webmaster. I am paying for your "free lunch". Why? Because that's the kind of guy I am. The hope is to start to fund the increasing cost in time and resources through advertising. This would also allow us to offer a financial reward for those who help with the magazine and sites. Scanning site for advertising purposes is prohibited. Phorm and their associates are prohibited from using this site.